This is the fifth in a series of special “Future Facts” on key policy issues facing Governor-elect Christopher J. Christie as he prepares to take office in January. New Jersey is heavily reliant on property taxes, compared to other forms of taxes, to pay for local services. At 42 percent, New Jersey ranks third, after New Hampshire (which has no income tax) and Vermont, in terms of the percent of all state and local taxes accounted for by the property tax. The national average is 30 percent. New Jersey households pay the highest property taxes in the country. 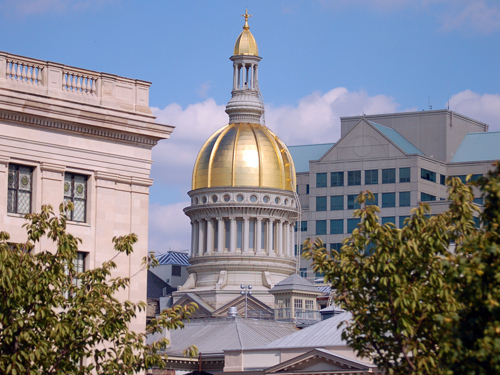 New Jersey’s median real estate tax bill of $6,320 (as estimated by the 2008 American Community Survey) is more than one-third higher than that in second-place Connecticut ($4,603). Local school funding is the largest expense item on the typical local property tax bill in New Jersey. The reliance on local property taxes to pay for local school funding causes a financial disincentive for towns to zone and build a mix of family housing. Many other states address their school funding in ways that are more cost effective and have a smaller impact on the creation of housing. Pennsylvania, a “home-rule” state like New Jersey, has nearly five times as many municipalities as New Jersey (2,565 vs. 566) but has fewer school districts — the average Pennsylvania school district is shared among five municipalities, while New Jersey does not even manage a 1-to-1 ratio of municipalities to school districts. Maryland, where schools are administered at the county level, has a population nearly two-thirds the size of New Jersey’s yet has fewer than 40 public school systems. In both Maryland and Pennsylvania, the median property tax bill is less than half what it is in New Jersey. Virtually every candidate for every public office in New Jersey talks about the need to reduce property taxes. Chris Christie is no exception. On his campaign website and in a post-election interview with the Asbury Park Press, Christie talked about reducing the burden of property taxes by, among other things, eliminating unfunded mandates; changing the rules of binding arbitration on public employee contracts; imposing a “hard” cap on municipal budgets; cutting middle-management positions in the public schools; and putting budget information online as a way to encourage greater accountability. What might these structural issues be? One is certainly the way we pay for our public schools. Funding education primarily with locally generated property tax revenues drives an intense competition for tax ratables among municipalities. Each wants to attract new commercial or age-restricted residential development but shies away from housing that brings schoolchildren — because the cost of educating these children is greater than the tax revenue generated by this kind of development. This, in turn, creates a housing shortage, which drives up prices — and drives relief-seeking residents to neighboring states. A second structural issue is the excessive number of tax-raising entities in the state (566 municipalities, 600+ school districts). With so many small governmental units vying for taxable commercial properties, the competition results in heightened disparities between the “winners” and “losers” in the ratables chase. As higher tax rates scare off more prosperous residents and businesses, further depleting the tax base, the vicious circle widens the gap between rich and poor in New Jersey, making local government fragmentation not just an economic problem but a social and moral one as well. While consolidation would probably result in some savings by eliminating duplicative costs, it would do little to alleviate harmful inter-municipal competition unless enacted on a widespread basis. This competition, and the negative land-use effects created by our current property-tax system, remain frustratingly absent from the tax-reform discussion. Four years ago, there was movement for a constitutional convention to address the issue of property taxes. Governor Corzine said he favored it, then backed off and allowed the Legislature to adopt a handful of measures designed to provide incremental property tax relief (as distinct from reform), many of which have since been washed away by the state’s budget crisis. Christie told the Asbury Park Press he plans to resurrect some of these ideas and use them as a “blueprint, a stepping-off point” for his administration. He added, however, that if “systemic forces” prevent reform of the property tax system by the mid-term election in 2011, he will call for a constitutional convention. Ultimately, a structural problem requires a structural solution — and there are many possibilities: Regional school districts, as in Pennsylvania. County-run school systems, as in Maryland. Regional tax-base sharing. Municipal consolidation. Shared services. Increased state funding for education. Or some combination of some or all of these. Many of Christie’s other initiatives — and, for that matter, many of the other changes in land-use practices that advocates have been promoting for decades — are unlikely to happen as long as municipalities have a disincentive to zone for more housing. And municipalities will almost certainly remain resistant to residential development as long as each municipality’s residents are on the hook to fund the new schoolchildren with little outside help. Nothing short of structural solutions will change the structural disincentives that currently distort our development patterns. I have often remarked that the property tax is an 18th century tax, a holdover from the days when 4 out of 5 New Jerseyans were farmers and one’s ability to pay taxes correlated well with the size of one’s farm. It also has a “have your cake and eat it too” aspect, in that homes are assessed for what the homeowner could get if he sold it – and could then no longer live there. This is particularly bad for senior citizens on a fixed income, and for anyone whose property has been rezoned commercial, because the assessment will then be based on what it would bring if sold to a commercial buyer. Finally, it is inherently unstable, in that a high-tax municipality will tend to lose industry because of the high taxes, which in turn drives taxes higher – and a low-schoolchildren, high industry town will gain even more because of its low taxes (see: Teterboro). The role of property taxes should be radically reduced, to what is needed to pay for services to property (e.g fire protection, roads, part of police protection) and the balance shifted to a state income tax which better reflects ability to pay. Taxpayers protest less about a tax which is withheld from every paycheck than they do about making out a large check quarterly. But at best a constitutional convention might change the tax structure – or might be controlled by business as usual politicians, thinking that people will decry any new tax as worse than the old system they have been complaining about. The Legislature won’t do it. Nobody complains that New Jersey has higher INCOME taxes than other states, so the claim of higher property taxes is disingenious: we simply balance high property tax against low income tax. There are more important concerns. Where taxation is concerned, the perspective of elected officials voting for or against revenue bills has seldom taken actual economic principles into consideration. If that were the case, our state and local governments would not attempt to raise revenue by the taxation of every income-producing activity and every form of asset. There is a wealth of literature and analysis by economics professors that stresses the need for a reduction (or elimination) of taxation on incomes “earned” from the production of goods or delivery of services, while shifting the revenue base to “unearned” (rent-derived) income flows and mere financial claims on real assets. If government is to raise a portion of revenue from the taxation of individual income, the system should be both simple to comply with and progressive. All individual incomes up to some amount (e.g., the state median) should be exempt. Then, eliminate all other exemptions and deductions. For ranges of income above the exempted amount, a gradually-increased rate of taxation should be applied. Above a certain level, almost all income is derived from rent-seeking investment activity that contributes nothing to the actual production of wealth or delivery of services. The argument against reliance on revenue from property taxation to fund our public schools is valid. However, there is an optimum amount of revenue that should be raised from property taxation regardless of what the revenue is used for. This optimum revenue equals the aggregate land value of each and every parcel of land within the taxing jurisdiction. Above this aggregate land value the tax is confiscatory; less than this amount leaves to land owners an imputed (or, when land parcels are leased to tenant users, an actual) rental income stream that is 100% unearned. This is because land values are generated by aggregate demand and are directly related to public investment in infrastructure and amenities. The taxation of property improvement values is, on the other hand, inherently confiscatory and counter-productive. Eassentially, improvement owners are penalized for maintaining or improving buildings by what amounts to an annual sales tax on the assessed value of their property improvement. A related issue is the matter of property assessment, which is almost everywhere influenced by local political pressures and rarely maintained at a uniform percentage of market values. Ideally, if property improvements were exempted from the tax base, the annual tax on land values should be equal to what the land parcel would yield under lease (i.e., its rental value). Even with the existing system the only solution to the assessment inequities is to turn the responsbility over to a state agency run by assessment professionals who meet strict professional credentials. There has been some discussion in the state legislature in favor of legislation that would provide a local option to communities, counties and school districts to adopt a two-rate form of property taxation. This type of bill would enable local government and school boards to gradually increase the effective rate of taxation on assessed land values while simultaneously reducing the rate on property improvements. At the end of, say, 5-8 years, property improvements might be fully exempted. Pennsylvania’s constitution has extended this option to some but not all taxing bodies, and some have moved in the two-rate direction (but, in my view, all too modestly to achieve the kind of equity and economic benefits that could be achieved with a more comprehensive change in the tax base as I have presented above.